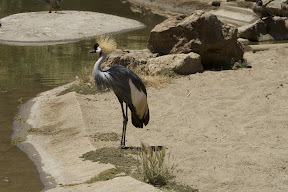 I got the pictures from my trip to the Oakland Zoo up last night, posted to my MobileMe Gallery. I got some really great shots with the lens I rented, and despite my batteries going dead just as the elephants were being fed a fun time was had by all. Kiki got some great shots of a hummingbird with that honking big 50-500mm f/2.8 lens she rented. Much better shots than mine. I was a little disappointed in the Oakland zoo. I thought it would be bigger. On the plus side they had larger big cat exhibits than the SF zoo does, but of course neither the Lions or the Tigers were in the mood to actually move yesterday, since it was over 90 degrees. I got a couple of good shots or a lioness with her tongue sticking out to keep cool. But we only ever saw the Tiger's feet as it slept under a bush. Oddly, there was a UPS box in the Tiger enclosure so we wondered if perhaps there was a delivery driver missing. I found that despite the size and weight of the lens, I really liked the focal length. I'm taking much better pictures with good quality glass than I've been taking with the "starter" glass I got with the camera. So go see the pictures!